For the oriental shrimp: In a bowl, combine the shrimp with the garlic, ginger, soy sauce, Hoisin sauce, yellow hot pepper paste (optional) and lemon juice. Cover and refrigerate for at least 1 hour. String 3 shrimp on a skewer and grill for 3 minutes. Flip over and cook 1 extra minute. For the cabbage salad: In a bowl, combine all the ingredients and dress with vinaigrette. Try alternating the shrimp with cocktail onions and tomato cherries for a different kebab. If you don’t eat shrimp, use chicken, but cook it for more time. Replace the cabbage salad with couscous, chickpeas or rice noodles. Each time you fire up the grill, you’re opening up a world of endless possibility when it comes to satisfying your taste buds. 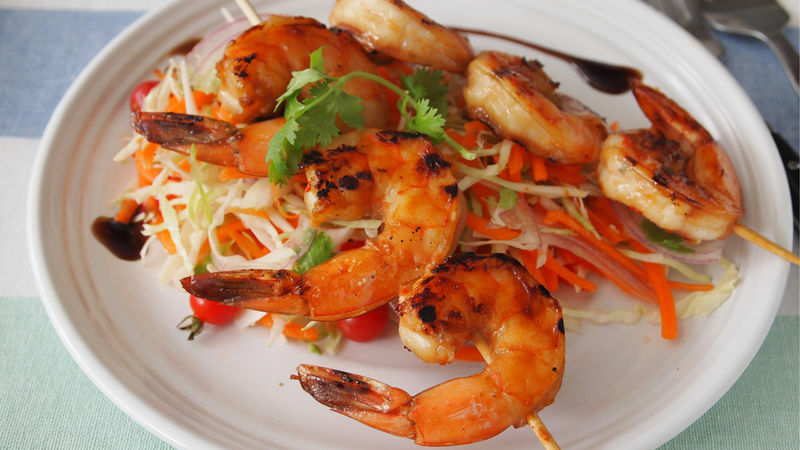 This marinated shrimp is a perfect example of grilled dishes. Pair it with a fresh and colorful cabbage salad for a complete, light and delicious lunch. Best of all, this shrimp cooks up in under ten minutes; you decide how long to marinate it. You can even leave it overnight. This simple marinade is not only easy to whip up, but I’m sure you probably already have all the ingredients you’ll need in your pantry. The flavor combination is delicious and, to give the shrimp an extra, adult kick, add a few tablespoons of Pisco or any other liquor you have on hand. Before cooking the shrimp, drain well, string on the skewers and grill for a few minutes so they’re nice and juicy. Be careful not to leave on the grill too long, since the shrimp will dry out and be less appetizing. I like to peel and devein the shrimp before marinating, but if you want you can marinate and cook them whole and each person can peel their shrimp as they eat them. Pair this dish with an ice cold beer or a fruity white wine. You’ll love the combination!